The first operators to roll out a commercial Narrowband IoT (NB‑IoT or LTE Cat NB1) network in the US, are u‑blox and T-Mobile US who have partnered up for the project. The multi‑mode SARA‑R410M‑02B is now certified for use on T‑Mobile’s network. A NB‑IoT only variant, the SARA‑N410‑02B, will also be available. u‑blox has been at the forefront of NB‑IoT technology and deployment. It has not only created the first NB‑IoT module to send a message over a live network, it also cooperated with Vodafone to perform early, pre‑standard trials of the technology in Spain which proved the performance potential and benefits of this new LTE‑based IoT protocol. Unlike other technologies like Bluetooth or WiFi, NB‑IoT is cellular based. Rather than having to install gateways to connect devices to the Internet, a simple u‑blox NB‑IoT module will directly connect them to the cloud, just like a smartphone. For end users, NB‑IoT is simply plug and play - they don’t have to worry about setting up proprietary wireless infrastructure. But unlike a smartphone’s cellular connection which is designed to transmit multimedia, NB‑IoT is designed for the characteristics of the IoT. Its energy consumption is optimised for battery powered sensor devices by matching data throughput to the low bandwidth requirements of most IoT applications. Performance is optimised for intermittent sensor data transmission, and the radio is allowed to spend most of its time in a sleep state. NB‑IoT also offers improved wireless coverage, especially for urban environments. While existing cellular and wireless standards perform relatively well in open spaces, NB‑IoT has the benefit of improved indoor penetration. For now, there are already clear benefits for smart city and utility applications. Whether for a water meter under a manhole cover, a parking sensor installed in a garage, or a device inside a building NB‑IoT will usually be the best wireless technology to use. Because it uses licensed cellular bands, it has minimal interference with existing radio signals, even in dense, RF‑noisy urban environments. Field trials conducted in Las Vegas proved that NB‑IoT can provide connectivity for mobile products, reporting location as well as other small amounts of data periodically while travelling at up to highway speeds. This makes NB‑IoT technology perfectly suitable at a global scale for applications such as personal or asset tracking, which require periodic location updates, while providing optimal battery life. 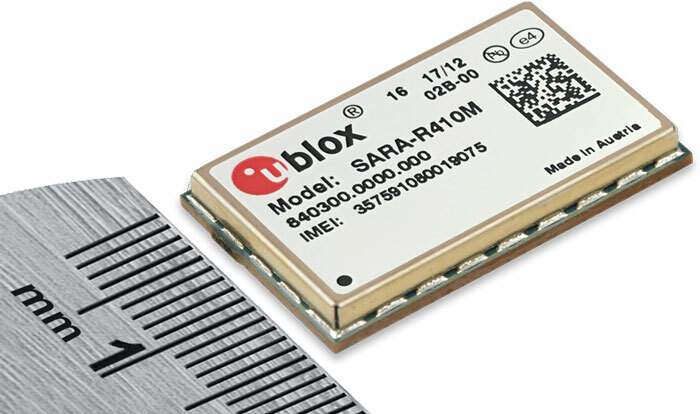 The module that’s been certified to run on T‑Mobile’s new NB‑IoT network, the SARA‑R410M‑02B is ultra‑compact, power efficient, and able to support both NB‑IoT as well as LTE Cat M1, also known as LTE‑M. This provides the flexibility to connect to other networks for roaming or higher bandwidth requirements. With an extended temperature range of -40 to 85°, it’s also well suited to industrial IoT applications. At u‑blox it is thrilled to see one of the largest IoT markets starting to roll out this exciting new technology. As one of the pioneers of NB‑IoT, its participated in hundreds of trials and demos, which have shown time and time again its ability to fulfill the promise of the IoT via lower power consumption, reduced hardware costs, ease of deployment, and strong signal penetration. With the T‑Mobile certified SARA‑R4/N4 series, the future will be establishing the new frontier of the NB‑IoT revolution. Guest blog written by Patty Felts, Principal Product Manager, Cellular Product Centre, u-blox.